That’s what I’d say about this delicious asparagus, ham, and ricotta pizza if I were trying to fix it up on a blind date. Every once in a while I get a craving for a non-tomato sauce, or “white” pizza, and when I do, I’m forced to choose between béchamel and an olive oil base. I love both styles, but was in the mood for something different, so I decided to use some ricotta and olive oil to make a spread, which I topped with smoked ham, asparagus, white cheddar, and Parmigiano-Reggiano. It tasted great, but I found its appearance to be somewhat unsightly. I knew the ricotta and olive oil would separate somewhat in the extra hot oven, but I thought with the other cheeses on top, it wouldn’t be noticeable, but as you can see, it was. The good news is, no one seems to mind, and it did taste great. By the way, you can certainly do a less rich, lower cal version by just using seasoned ricotta without the oil. Anyway, “new pizza ideas” is always a popular food wish, and I hope this ricotta spread inspires lots of pizza experimentation in your kitchen. If you need a pizza dough recipe, I used this great no-knead version, but if you prefer something faster, this Wolfgang Puck-inspired recipe is also a winner. Enjoy! Michele and I are heading back to San Francisco after a fantastic 2012 Passport to Dry Creek Valley! I forgot to bring that wire that lets me download the photos I took, but hopefully tomorrow I can show you what we served. 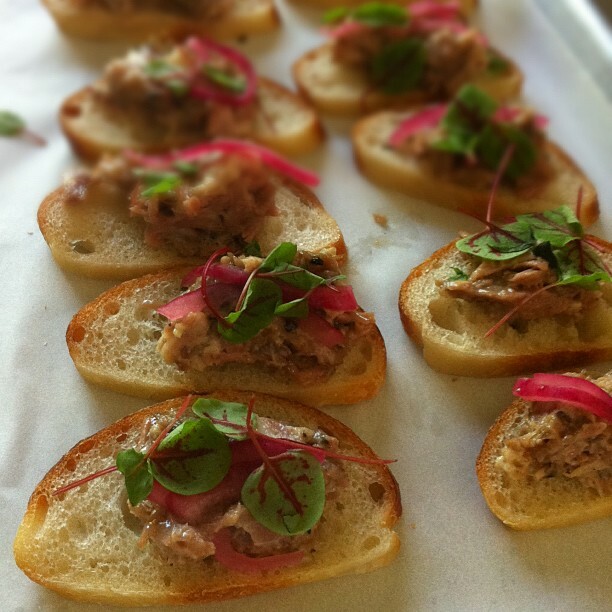 Pictured here is a iPhone shot of our "Tonno del Dry Creek," which was some incredible pork confit from Dehesa (you'll be hearing a lot more about them soon), topped with picked onions, and "hearts on fire" greens. By the way, I will be posting a brand new video later this evening featuring an odd, but very delicious ham, asparagus, and ricotta pizza, so stay tuned! Michele and I are in Sonoma for the 2012 “Passport to Dry Creek Valley.” If you've been following this blog for awhile, I'm sure you've read about this event before, but if not, here's a little taste from last year. We'll be doing the food at the gorgeous Frick Winery for the 16th consecutive year! Despite all the hard work, it's a lot of fun and we look forward to this every spring. I'll be back Monday with a new video, and hopefully some decent photos of this year's offerings. Stay tuned! Cooking fish in parchment paper is incredibly simple, and yet fairly terrifying for a novice cook. Since the seafood is encased in paper, there’s really no good way to check if it’s done, and so you’re basically going on time and experience, and this can be scary for even grizzled old chefs. The good news: if you use a large, center-cut salmon filet, about 8 or 9 ounces, and cook it for 15 minutes at 400 degrees F., you’re going to be very, very close. After making this a couple times, you’ll adjust your cooking time to suit your personal needs, and once you dial it in, it’s a foolproof technique. 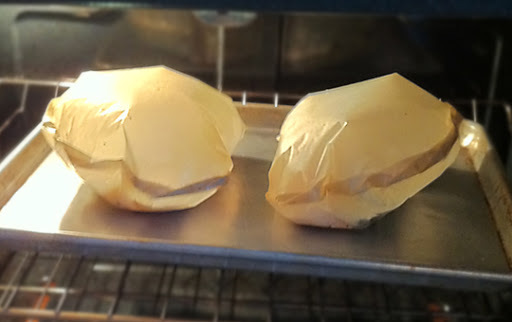 So, where and how do you get some professional parchment paper? 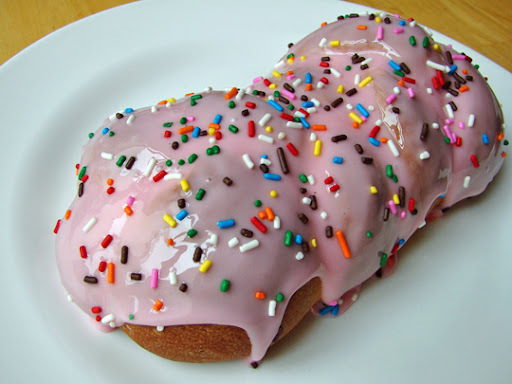 It’s as easy as finding a donut…literally. Every single bakery in existence has a box of parchment paper sitting on a shelf somewhere. It comes in large boxes, containing thousands of sheets, and if you’re nice and/or offer them a few bucks, they will happily give you some. And the great thing about parchment paper is that it’s so thin, when they pinch you off a quarter-inch from the top of the pile, they’re actually handing you hundreds of sheets. So, for a mere $5 bribe, you’ll have a couple years worth of paper. Anyway, once you’ve acquired the parchment, the rest is easy. Just make sure your fish is completely thawed. It doesn’t need to be room temp, but if it’s still ice-cold, the cooking time will be longer. Also, be sure whatever vegetables you include in the packet are pre-cooked enough to finish during the 15 minute cooking time. By the way, in addition to cooking “en papillote,” parchment paper it’s also perfect for those occasional proclamations and decrees. Speaking of which, I hereby proclaim that this was really fun and delicious, and I decree that you give salmon in parchment a try soon. Enjoy! cooked potatoes and veggies as needed. *Note: I served mine with a very light mustard aioli, which was simply mayo, Dijon, lemon juice and a touch of garlic. Bake for 15 minutes at 400 degrees F., then let sit 4-5 minutes before cutting open. Next Up: Cooking in Parchment! French onion soup is a very easy recipe. So, it’s a little ironic that this American French onion soup is an attempt to make things even easier. Then again, taking ideas that don’t need improving, and changing them anyway, is a time-honored American tradition. Instead of going “French” on the onions, and cutting thin slices, we’re doing more of an extra large dice. I like the flavor and texture this cut provides, and there’s no danger of being chin-slapped by a long, steaming strand of onion. To make the caramelizing step a bit easier, we’re going to use the oven. You can just toss the onions in, stir it once in a while, and wait for them to brown. You don’t have to stand there and watch as closely as you would on the stovetop, and since the oven is blasting the pan with heat from all sides, you get a nice even color. The last Americanization is a departure from the classic gruyere cheese. My love for gruyere is borderline inappropriate, but keeping with the theme, I decided to go with a 50/50 blend of extra-sharp New York cheddar and mild Monterey Jack. It was wonderful, and a nice change of pace. Regarding the ominous vinegar warning in the video – I think a little touch of sherry vinegar really balances the flavors perfectly, but like salt, everyone’s palate is different. So, if you haven’t used it before, it may be a better to just add the vinegar, to taste, to the finished soup. Drip a little in, taste, and adjust. Anyway, spring weather means plenty of cool, rainy days, and what better way to enjoy those than with a nice bowl of onion soup? Whether American, French, or some other yet-to-be-discovered cultural variation, I hope you give this a try soon. Enjoy! I'm not sure how many of you tried "turning mushrooms" after seeing our post Friday, but just in case, this cream of mushroom soup will help you put those carved beauties and any trimmings to delicious use. When you're done admiring your knife work, chop them up, and enjoy one of the best soups ever invented. 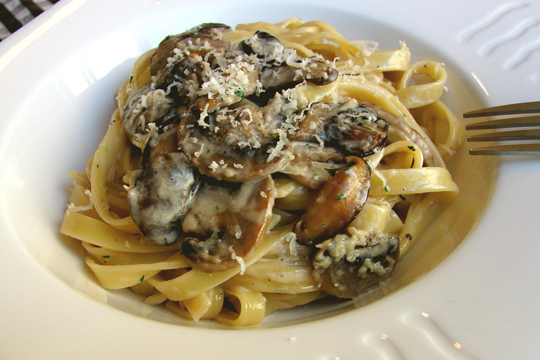 I've also added links to some of my other favorite mushroom recipes. Have a happy Earth Day, and as always, enjoy! How to “Turn” a Mushroom – An Earth Day Weekend Special! I’ve really never gotten that excited about Earth Day, and this year is no different. Don’t get me wrong; I’m a huge fan of the planet (especially love the gravity), so on Sunday, April 22, I will be giving thanks to Mother Nature, as well as all the heroes who fight the good fight to keep her happy and healthy. However, for an old food blogger like me, a “holiday” like Earth Day is more about key words and search engines than seabirds and algae. And of course, if you’re going to do a tie-in for Earth Day, you can’t get any “earthier” than mushrooms. This video for how to turn a mushroom represents another classic technique I learned in culinary school, which was really never applied in a restaurant. Along with things like aspic and ice carving, turning mushrooms is one of the things that chef instructors LOVE to teach. Not to impart vital skills to their students, but to simply show-off…and that’s exactly why I’m showing you. Enjoy! No matter how basic or boring an ingredient or dish is, I can usually come up with something to pontificate on, but for this lovely braised red cabbage recipe, I’ve got absolutely nothing. I could go on about how I’m not sure what that color red is called, but I did that in the video. I could joke about taking one for the team, and keeping this side dish purely vegetarian for a change, but there’s nothing funny about not adding bacon. I could suggest a few easy ways to turn this into an amazing one-dish meal, by adding some smoked sausage or leftover pork ribs, but that’s probably so obvious that I’d be insulting your intelligence. Or, I could have gone into a great, old prep cook anecdote about how I won $10 from a pastry chef in 1987 by juggling red cabbages on the hotline during service, but that would have meant making up the story, since it was actually cantaloupes. No, I’m not going to mention any of that. I'll simply suggest that if you want an easy, gorgeous looking, and very tasty vegetable side dish, then you should give this a try soon. Enjoy! *Note: there are SO many ways to tweak this recipe! Raisins, currants, shallots, onions, leeks, apples, and pears are just a few things that rock in this recipe. How to Turn Corned Beef into Pastrami – Abra-ca-deli! Great pastrami is not the easiest thing to find west of the Catskills, so a few years ago I embarked on a mission to find a way to turn the common corned beef into something similar. My goal was to come up with a reasonable substitute that could be done in less than a day at home, without a smoker, or any other special equipment. Impossible? No! As you'll see in this video, I came up with a fairly easy method, which really worked well. While this homemade pastrami may not be exactly what you get at those famous New York delis, it's tender, very tasty, and piled between a couple slices of rye, makes a great sandwich. The spice blend is fairly traditional, except for the smoked paprika addition. This gives the beef a nice, very subtle smokiness without having to worry about the considerable time/temperature management required by an actual smoker. By the way, this is a pretty fiery rub. If you’re scared, you may want to reduce the amount of pepper(s), and/or leave out the cayenne. However, if you want the punch of a spicy, intensely aromatic pastrami, then this recipe will have you smiling, from the first mustard-shmeared bite to the last. I hope you give this a try soon. Enjoy! Editorial Note: No, you are not going crazy. We did do this video post before, but it was filmed for About.com, and played only on their website. That old post is no longer up, and being replaced with this one. Thanks! My friends at All Clad recently sent me an invitation to take part in a contest to develop a recipe showing off their 10-inch Stainless Steel Fry Pan. After carefully considering the offer for several seconds, I let them know I’d be thrilled to participate, and even more thrilled to accept their free pan. After a little brainstorming, I decided seared beef medallions with pan sauce would best highlight the benefits of using this type of pan. Once I decided on a general direction, it was time to pick ingredients. For medallion meat, I chose soft and buttery tenderloin. For the pan sauce, I went with mushrooms and tomato, as I knew they’d allow me to show how spectacular a sauce one can achieve with proper caramelization. There are two huge advantages to high-quality cookware (three, if you count how cool they look hanging on your pot rack). Because the steel is thicker and denser, the pan not only retains heat much better, but it distributes that heat very evenly. In this recipe, the advantages of both are seen quite clearly. First of all, we’re able to do a very high-heat sear, with the surface of the medallions getting a beautiful brown crust, while the inside stays nice and rare, thanks to the short cooking time the pan’s heat retention affords. Secondly, as we’re caramelizing the mushrooms and tomato sauce, you can see the advantages of superior heat distribution. This sauce is very easy, but if you’re using a thin, cheap pan, you’re going to get “hot spots,” which makes browning the sauce base more difficult. Certain areas will scorch and burn quickly, and you don’t get nice even caramelization. Here, you can see that wasn't an issue. Above and beyond the advantages of the cookware, the recipe tasted amazing. I mean, come on, I can’t give the pan all the credit. It’s one of those dishes that unless someone watched you make it, they’d never believe how fast and simple it is to prepare. By the way, this wonderful sauce would work just as well with pork, veal, or chicken. Anyway, thanks to All Clad for the pan and invitation to participate in this contest. I can’t wait to see what other bloggers are participating, and what they’re making. Please stay tuned for more details and results in the near future. In the meantime, I hope you give this great recipe a try soon. Enjoy! Season beef medallions generously with salt and pepper to taste. Put vegetable oil in a stainless steel pan, and place over high heat. When the oil just begins to smoke, sear the beef for about 2 minutes per side. The meat should get a nice brown crust, but do not cook all the way through, as it will finish cooking in the sauce. 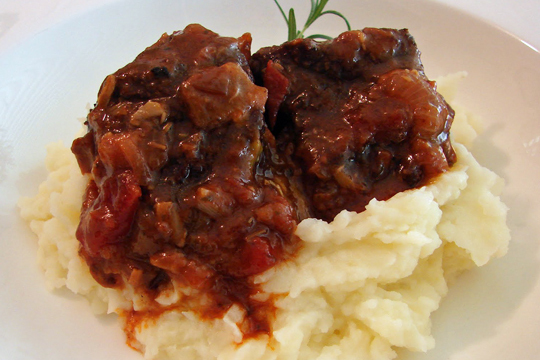 Turn off heat, and remove beef to a plate, and reserve until needed. Add the butter and olive oil to the pan, and place over medium-high heat. Add the mushrooms and a pinch of salt. Cook the mushrooms, stirring often, for about 10 minutes, or until very well browned. Add the tomato sauce, and cook, stirring, for about 5 minutes, or until the tomato sauce thickens and caramelizes on to the bottom of the pan. 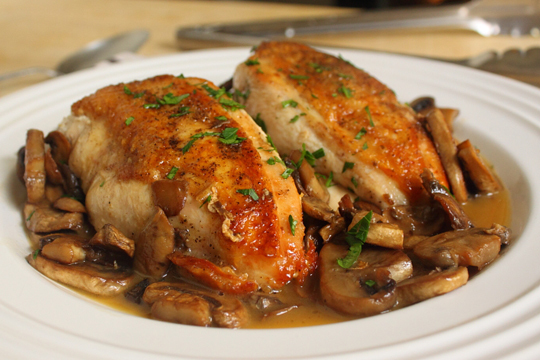 Pour in the Marsala wine, and raise heat to high. As the wine comes up to a boil, use a wooden spoon to scrap any caramelized bits on the bottom of the pan. When almost all the wine has evaporated, add the stock or broth. Bring to a boil, and cook, stirring occasionally, for about 5 minutes, or until the mixture has reduced by about half. Reduce the heat to low, and add the beef medallions back in. Simmer gently for 2-3 minutes, or until the meat is heated through and cooked to your preference. You can add more stock if sauce seems too thick. Remove the medallions, and divide on four hot plates. Turn the heat off under the sauce, and stir in the oregano and cold butter. Stir constantly until butter has disappeared into the sauce. Taste for seasoning, and adjust if needed. Spoon over meat and serve immediately. Enjoy! ...or at least that's what I heard on Twitter today. Who decides these things, and how do they pick the day? Don't know, and don't care, because it give me an excuse to post our famous Inside-Out Grilled Cheese Sandwich! Follow this link to read the original post, and as always, enjoy! Every once in a while, I post a recipe that I’ve received exactly zero requests for, and this gorgeous Mongolian pork chop is the most recent example – sort of ironic, considering this is video 700, and I’m celebrating the milestone by going rogue! While 95% of the videos you see are inspired by actual “food wishes,” sometimes I’ll remember something so delicious, I just have to add it to the library. One of my favorite restaurants anywhere is Mustards Grill, located in California's beautiful Napa Valley. Mustards is owned and operated by chef Cindy Pawlcyn, and for decades has been serving the best kind of new American comfort fare. While I love all the food, the standout dish is their famous Mongolian pork chop. This is my slightly simplified version, but still very close to what you’d experience at Mustards. She adds a little green onion to the marinade, and I would’ve also, had I not forgotten it at the market. She also puts a touch of cilantro in the mix, but I prefer to use it freshly chopped to garnish the cold mustard sauce (something I should have mentioned in the video, but did add to the ingredient list). Once marinated, these pork chops can be cooked any way you like, but for the true experience, you’re going to want to cook these on a charcoal grill. For me, it’s the smokiness that brings all these flavors together, but pay special attention to my warnings about direct high-heat. Anyway, if you ever find yourself in Napa Valley, I highly recommend you stop in to Mustards and enjoy this great American treasure. But, if that’s not possible, or you simply can’t wait, then give this a try soon. Enjoy! *If you want the “real” original recipe, here's a link to check out. Next Up: Video 700...Mongolian Pork Chops! While they don’t get the same love as French fries, home fries, or steak fries, cottage fries more than hold their own against their potato side dish fraternity bothers. And, unlike their French cousins, these easy cottage fries actually crisp up quite nicely in the oven, and as I described in the video, resemble fat, succulent potato chips. I don’t know about you, but to me there’s nothing about “fat, succulent potato chip” that doesn’t sound good. They’re called cottage fries because they supposedly look like the shingled roofs on those cute little houses you see in the movies and on travel brochures. Appearances aside, I find serving and eating something associated with “cottages” to be just a little more relaxing and civilized than other less vacation-y potatoes. I used Yukon gold potatoes, which as you’ll see, worked fine, but I do prefer the slightly starchier russet. I would avoid any of the red varieties, as they have a much waxier texture, and don’t get as crusty as other types. I also used a silicon mat to cook mine on, but you’ll get even crispier edges if you use foil, or put the sliced potato directly on a non-stick baking sheet. Of course, the seasoning options are only limited by your imagination and self-control. I love Herbes de Provence in this, but literally any fresh or dried herb will work here. Keep in mind, these chips are great just seasoned with olive oil, salt, and pepper, so you’re cooking from a position of power – don’t try and do too much. I hope you give these great change-of-pace “fries” a try soon. Enjoy! I tried another batch of pavlova, but this time piped it out as individual rings. It worked well, and oddly enough cooked in about the same time as the larger one we just did (they did get more color, but the texture was very similar). I know some of you asked about doing smaller versions, so here's the visual proof it will work. Enjoy! I know that Easter is a religious holiday, but for me, it'll always be associated with this sweet, shiny, aromatic bread. If you grew up in an Italian-American home, chances are pretty good you enjoyed something similar, but if you haven't, you must give this recipe a try! This originally aired back in 2009, and the link below will take you to that post for all the details. I hope you all have a wonderful weekend, whether you're celebrating Easter, Passover, or just a beautiful spring day. Enjoy! Click here to read the original post, watch the how-to video, and get all the ingredients. 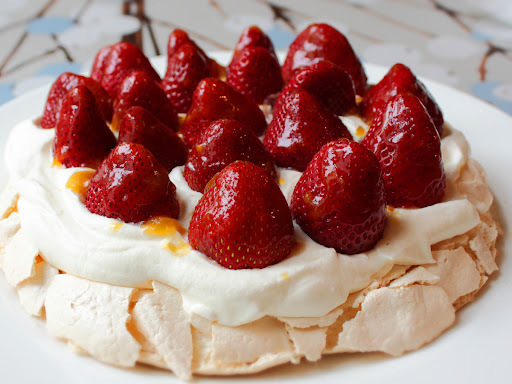 Fresh Strawberry Pavlova – Cracking Up Down Under! This crispy on the outside, soft and gooey on the inside, baked meringue is named after Russian ballet dancer, Anna Pavlova, who must have done one mean "fouetté en tournant." Some people think they can dance; some people know they can dance; and some people get desserts named after them in New Zealand. Why she inspired what is basically a large, crispy marshmallow isn’t completely understood. By the way, Australia also claims to have invented the Pavlova, and this controversy is the main reason people from New Zealand and Australia hate each other. Update: I've been informed that New Zealand and Australia do NOT hate each other, but enjoy more of a proud rivalry. This is an odd dessert, but one that’s a lot fun to make and eat. It's also fat-free…that is, until you pile on the whipped cream, but at least it starts off fat-free. Fresh fruit, especially berries and kiwi are standard fare, and it’s the tartness of the acidic fruit that balances the sweet, gooey crunch. As you’ll see in the clip, I indulged in a little bit of culinary exhibitionism, and tried a new presentation based on the old, “if you can’t beat’em, join’em,” school of thought. Instead of worrying about a few cracks around the edge, I decided to go full-shatter, and the results are here for all to see. I kind of liked it, but I’ll let you be the judge. Is it visually arresting? Cool? Annoying? Or, like my friend Tamar from Starving Off the Land implied, does it cause you to think about how badly your driveway needs repair? Looks aside, strawberries are piled sweet and high at the markets right about now, and this would make a lovely dessert for the holiday. Anyway, I hope you give this a spin…or as I should say in honor of Ms. Pavlova…a fouette! Enjoy! *Note: do not get ANY egg yolk in the whites, or this will not work. Next Up: The Blunder from Down Under? This mint-crusted rack of lamb was inspired by a lamb steak recipe we did a few years ago, which featured a minted honey vinaigrette. I loved how the sweet, herbaceous dressing worked with the subtly gamey meat, and that memory filled me with confidence as I planned out this video. Lamb is obviously a popular Easter menu option, and while I have no problem with you slathering your meat with green mint jelly…really, I don’t…my mom’s fridge always had a jar of the stuff…I do hope you’ll consider this slightly higher-end application. I know some will be extra curious about the blanching of the mint, but I’m afraid my less-than-scientific answer may leave you unsatisfied. I learned a long time ago that if you give your green herbs a few-second blanch before using, the heat locks in the color, and they stay nice and green in whatever you’re preparing. Of course you can Google for more information, or better yet, you can simply make the recipe in blissful ignorance. Speaking of bliss, one of my favorite things about rack of lamb is just how easy they are to cook. As long as you own a digital thermometer, you’re going to have to try really hard not to get pink, juicy meat. They’re not cheap, but there’s almost no waste, and the meat is mild and very tender. By the way, yes, those are sweet potato tots! And no, I can’t show you how to make those at home. The recession has hit the U.S. tater tot industry very hard, and I’ll be damned if I’m going to put any more of those fine folks out of work. Anyway, if you’re looking for an easy and impressive option for Easter dinner, I hope you give this a try. Enjoy! Every once in a while I get an urge to remind you about some previously posted, seasonally appropriate video recipe. 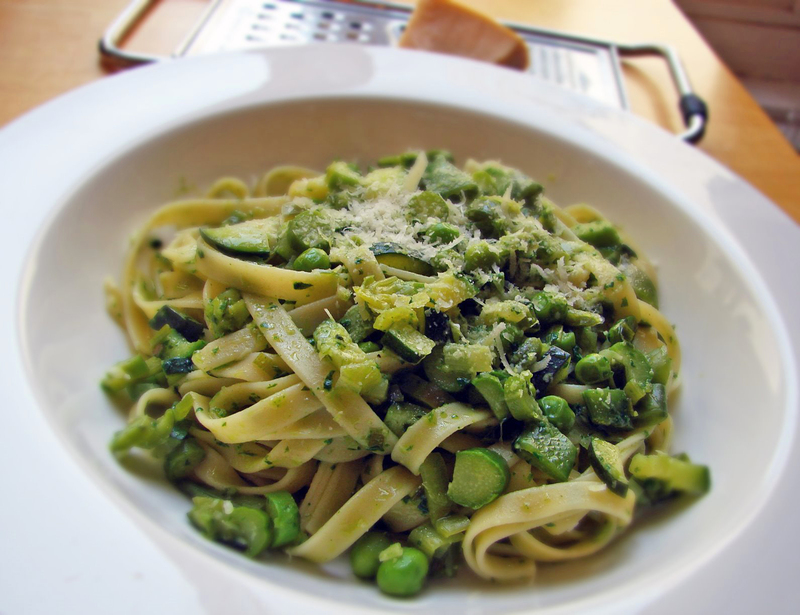 Today, it was seeing an old photo of our pasta primavera that inspired my need to re-feed. Many of our fresher (greener?) viewers may not have seen this classic springtime pasta before, and if that’s the case, run, don’t walk, to the nearest farmer’s market, fill a basket with fresh green veggies, and get cooking. You can click here to read the original blog post, and get all the ingredient amounts. Enjoy!